Grand Jury Indicts Dozens Of Atlanta Educators Over Cheating Scandal : The Two-Way Among them is former Atlanta superintendent Beverly Hall, who was the national superintendent of the year in 2009. 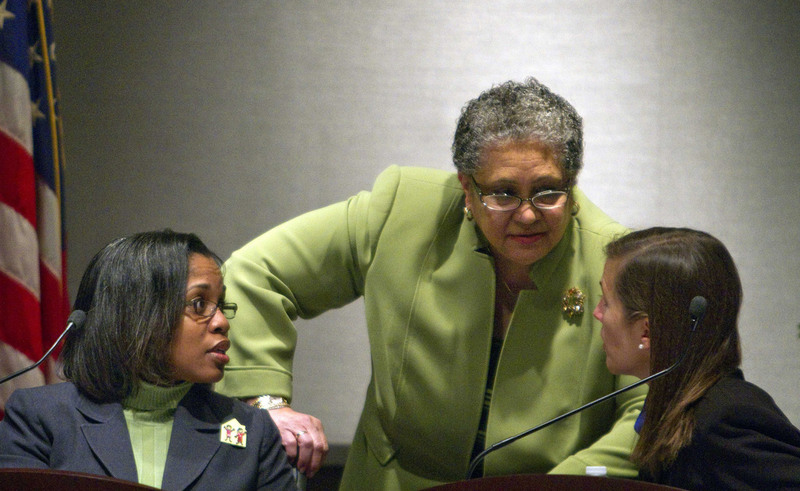 Former Atlanta Public Schools Superintendent Dr. Beverly Hall, center, speaks with school board member LaChandra Butler Parks, left, and Cecily Harsch-Kinnane, vice chair of the board, right. Among those indicted is former Atlanta superintendent Beverly Hall, who in 2009 was crowned the national superintendent of the year. This means that a grand jury has found there is enough evidence for a prosecutor to proceed with a criminal case against the educators. WSBTV in Atlanta reports that 35 Atlanta Public Schools educators have been charged with racketeering and "Hall has also been charged with false statements and writing, theft by taking and false swearing." "The indictment is not yet public because it has to first be accepted by a judge and filed with the clerk of court. "Grand jurors deliberated about an hour before voting. "Those indicted won't have their legal expenses paid by Atlanta Public Schools, said school board Chairman Reuben McDaniel. The board changed the school district's policy last month so that it won't be responsible for representing employees when criminal actions are brought against them for job-related actions." WABE's Martha Dalton is tweeting from press conference in Atlanta. She reports that District Attorney Paul Howard said that "without Hall, [the] cheating conspiracy couldn't have happened." Howard said he hopes all 35 people indicted will turn themselves in. "While these educators have not been found guilty of a crime, the indictments should serve as a warning that test security should continue to be a top priority for educators in every school. No matter what happens in the courts, our children are the ones who will pay for the cloud cast by this cheating investigation. Now that this issue is in the hands of the District Attorney, we will all be watching closely to see the outcome."